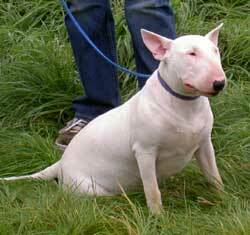 The Bull Terrier is an English breed and is a cross between the Bulldog and the now extinct White English Terrier. Originally bred for dog fighting and badger-baiting which were eventually outlawed during the first halt of the 19th century.The first bull terrier was bred in the 1860s and it is thought to include strains from the Dalmatian and Pointer. They are strongly built, muscular, well balanced and active with a keen, determined and intelligent expression. They are excellent guard dogs and extremely loyal to their owners. Early obedience training is highly recommended.